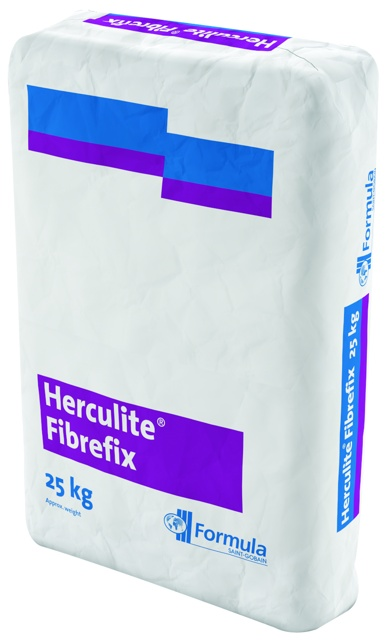 Herculite Fibrefix Plaster - Industrial Plasters Ltd.
Herculite Fibrefix is an excellent adhesive for the fixing of decorative plaster work, with very strong contact adhesion. Suitable for the fixing of coving, cornice work, ceiling roses etc., is it also ideal for filling, stopping-in and making-good. Specially formulated to meet the exacting demands of onsite use, including a good ‘pot life’ and outstanding ‘grab’ for installation. The 1kg pack comes in a plastic pot with a sealed lid and packed in an outer carton of 18. Ensure all wall and ceiling backgrounds are sound, clean and dry. Remove any wallpaper from background surfaces. Painted and decorated surfaces should be scratched to form a key and dampened to remove any dust and loose material. For best adhesion to all backgrounds, prime the area with a bonding agent before application. Ensure all tools are clean and free from contaminated materials and always mix in a well ventilated area. Please use with the recommended plaster to water ratio, with a mixing time of approx. 2 to 4 minutes or with until mixed to a smooth paste. The plaster to water can be adjusted to suit the individual application, however changes to plaster to water ratio will influence product performance particularly setting time and strength. Apply sufficient Herculite Fibrefix to Cove or Cornice to ensure good overall contact with the background. Press firmly into place and then remove any excess adhesive and use it to "make good" any mitres/joints.